Gilded bronze, iolite and tinted rock crystal cuff bracelet from Goossens Paris. Bronze is soft so bracelet adjusts to fit both small and large wrists. Tinted rock crystal and gold plate cuff bracelet from Goossens Paris. Cuff is malleable and can be worn on both small and large wrists. Flower motif brooch from Goossens Paris. Made with clear rock crystal and bronze plated with 24k gold. 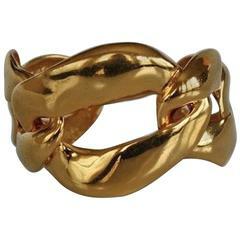 Gold plated triple row cuff bracelet from Goossens Paris. David Webb crystal cuff bracelet, finely crafted in 18 k white gold and platinum, featuring carved rock crystal and brilliant-cut diamonds, weighing approximately 5.90 carat. 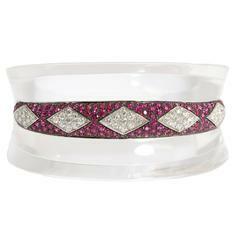 An unusual cuff bracelet in rock crystal with rubies (8 cts) and diamonds (2.60 cts). Circa 1980s. Platinum and white gold diamond and crystal cuff bangle, signed David Webb.